Parveen Travels, the most preferred travel brand of South India has always taken the extra step to make women feel safer and privileged during their journey with them. 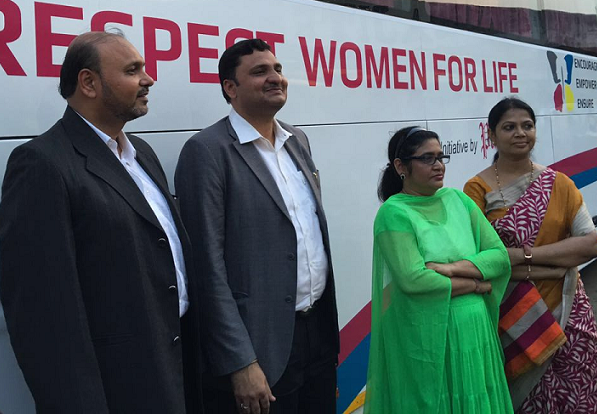 The company has now launched ‘Respect Women for Life Campaign’ that ensures total safety and encourages women to take up challenging jobs. Parveen Travels is going to recruit and train women through one of its group companies. Mrs. Salma, acclaimed writer and poet, the Chief Guest who unveiled the new concept said, “Women safety is the responsibility of society as a whole. It is a great initiative from a private company like Parveen Travels who have taken on a big responsibility to show how much they value and respect women. Times have changed as more and more women are well educated, working at important companies and travel more”. Ms. Reihana, the well-known Music Director and Playback singer who was present lauded the company and congratulated the management for coming out with a unique concept for women. The Directors of the company Mr. Aarif and Mr. Sadiq were present on the occasion and said that it was because of their customers and goodwill that they are constantly innovating and trying to raise the bar in all aspects of safety, comfort and providing extra care for women passengers. For Further information, contact: Mr. A. Sadiq, Director, Parveen Travels – 98400 97899/ Prism PR, 044-2466 1153.